The shower is the time when we want to let go of daily stress and relax. 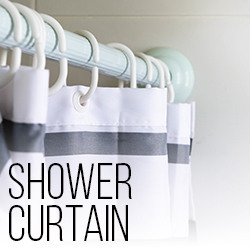 Shower curtains take a big space in our bathrooms hence they are vital elements of decoration can give a drastic change once we hang them. They color up the room like no other decoration item. What our eyes see during shower affect our mood as well. Hence there are so many patterns we offer. Our Ambesonne Collection has a variety of prints such as landscapes, skulls, floral prints, fashion or anime themed curtains.